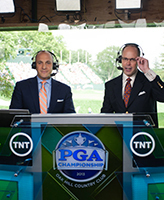 Former English and FTT student Peter Bevacqua ’93 is CEO of the PGA of America. While buried in work at a large New York City law firm in the late 1990s, then-28-year-old Peter Bevacqua penned a letter to United States Golf Association, asking for a job. Almost 11 months passed with no response, Bevacqua assumed they had pitched his letter. But then he got a phone call inviting him to interview for the organization’s in-house lawyer position. He rented a car, drove from New York to Far Hills, N.J. and landed the job. So began his career in the golf industry, which culminated in November when he became Chief Executive Officer of the PGA of America. He previously worked as managing director of the U.S. Open, as well as the USGA’s chief business officer. When Bevacqua considers the path that led him to a golf-lover’s dream job, he credits his liberal arts education at Notre Dame, which gave him the freedom to let his career naturally take shape, he says. 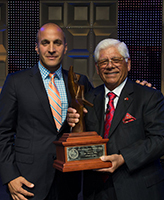 Peter Bevacqua with famed golfer Lee Trevino. Bevacqua majored in English and also spend a great deal of time in the Department of Film, Television, and Theatre (FTT). As an undergraduate in the College of Arts and Letters he took courses examining the works of Mark Twain, the history of Italian cinema, and Dante’s Inferno. He remembers one FTT course focused on Alfred Hitchcock films, and another that included watching a handful of Bruce Springsteen music videos. As CEO of the world’s largest sports organization, Bevacqua regularly shakes hands with golf’s biggest stars, and frequently appears on various television programs as the face of PGA. On a recent Saturday in August, Bevacqua flew from Palm Beach Gardens, Fla. to Rochester, New York for the PGA Championship, where he appeared on the Golf Channel and CBS. The following Tuesday night, he had dinner with Tiger Woods, Phil Mickelson, and Rory McIIroy. Peter Bevacqua (left) frequently draws on the verbal communications skills he developed in Notre Dame’s College of Arts and Letters. Bevacqua represents the PGA and its 27,000 golf professionals who promote and teach the game throughout the country. The organization runs the PGA Championship, one of the four major golf tournaments in the country each year, as well as the Ryder Cup. He spends much of his time communicating with members, players, broadcasters, and equipment manufacturers. As CEO, he oversees a staff of about 300 people. Bevacqua frequently draws on verbal skills he learned while discussing literature and film with his peers at Notre Dame, he says. And, as he develops goals for the PGA of America—such as adding diversity to the game of golf and making it more popular for busy Americans—he continues to rely on his ability to think critically and communicate effectively. After Bevacqua graduated from Notre Dame, he felt armed with a broad knowledge base and a wide array of possible career paths, he says. He worked as a teacher at a private school in Greenwich, Conn. for one year, and then debated going to film school or law school. He chose the latter, attending Georgetown University Law Center. Bevacqua advises current students to resist worrying about exactly what their job will be when they graduate. Instead, he says, students should study what interests them, and study it well. Originally published by Mary Kate Malone at al.nd.edu on August 23, 2013.